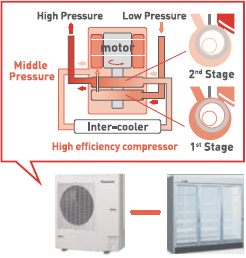 Total electricity consumption of food retail convenience stores is decreased by the installation of the latest high-efficiency facilities and high-efficiency chillers with natural refrigerant (CO2 refrigerant), inverter-controlled air-conditioners, and LED lighting. As a result, CO2 emissions due to electricity consumption are reduced. The project covers a total of 12 grocery stores located in Special Capital Region of Jakarta and its surrounding districts.